Recently I’ve been trying new techniques to better my SFX skills. After watching a dozen or so tutorials on YouTube, I had a fresh approach to SFX and a head full of ideas. For this piece, I wanted to achieve a more realistic look, as I tend to stray towards theatrical makeup! 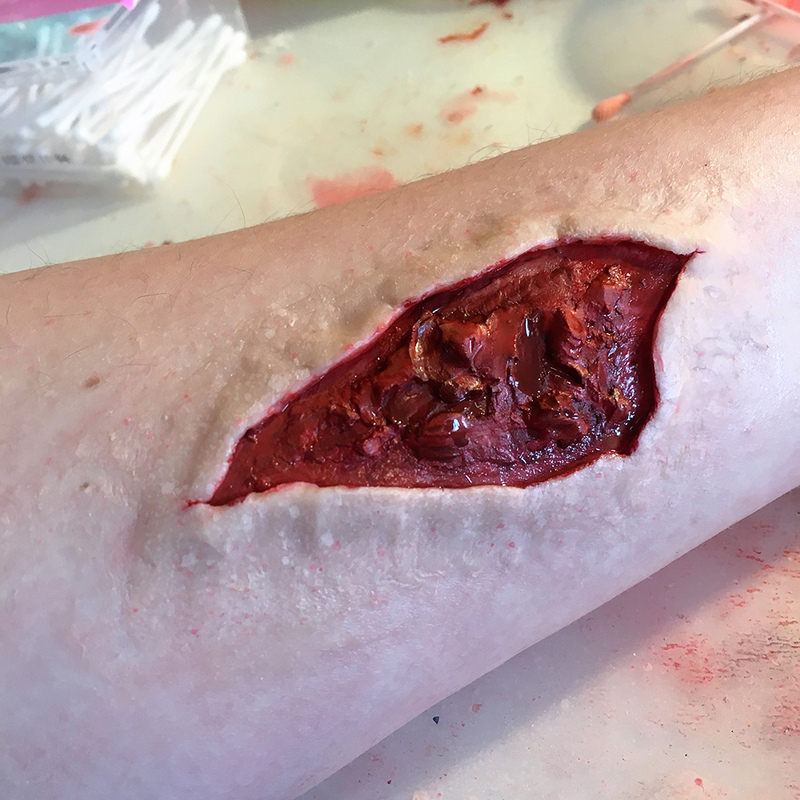 I aimed to create a fleshy texture inside the wound and color match the outside with my own skin. Sounds intimidating at first, but with practice, patience and some medical books for reference I was set to go. 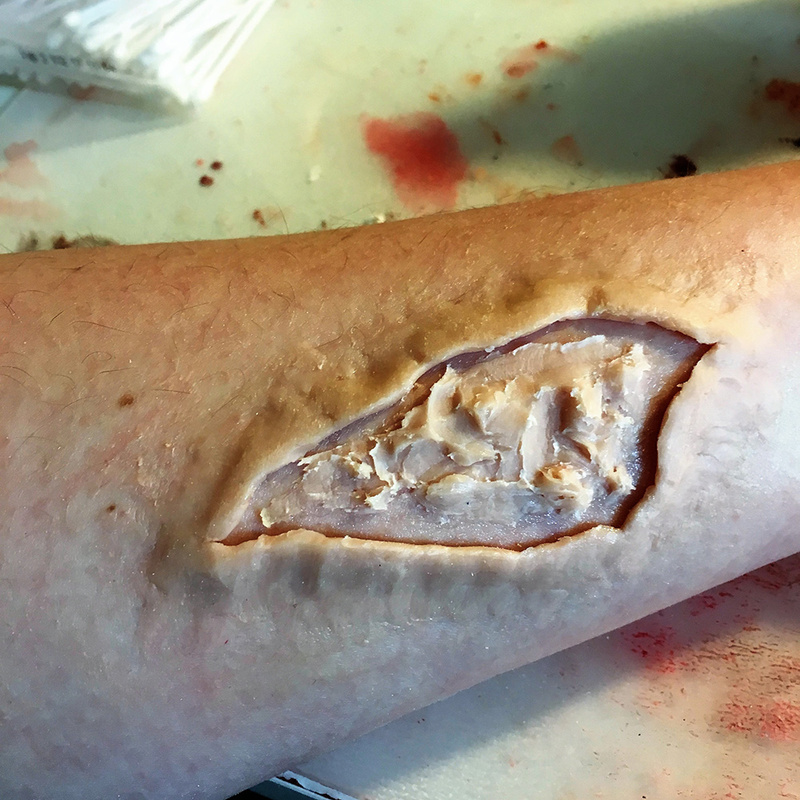 In this week’s piece, I’ll show you how I made this realistic fleshy wound with some of the best techniques I’ve found so far. Apply a good coating of spirit gum to your forearm, and whilst this is drying scoop out some scar wax and roll into a ball with your hands. When the spirit gum is tacky, flatten the scar wax with your fingers and press onto the area. Begin to smooth this out into your skin with your finger tips or metal spatula, use Vaseline to help blend. Your layer of wax should be as thin as possible for the most realistic result! Use face powder over the area to remove any shine. Now, using your metal sculpting tools or spatula, dip the end in Vaseline and cut a shape into the wax. 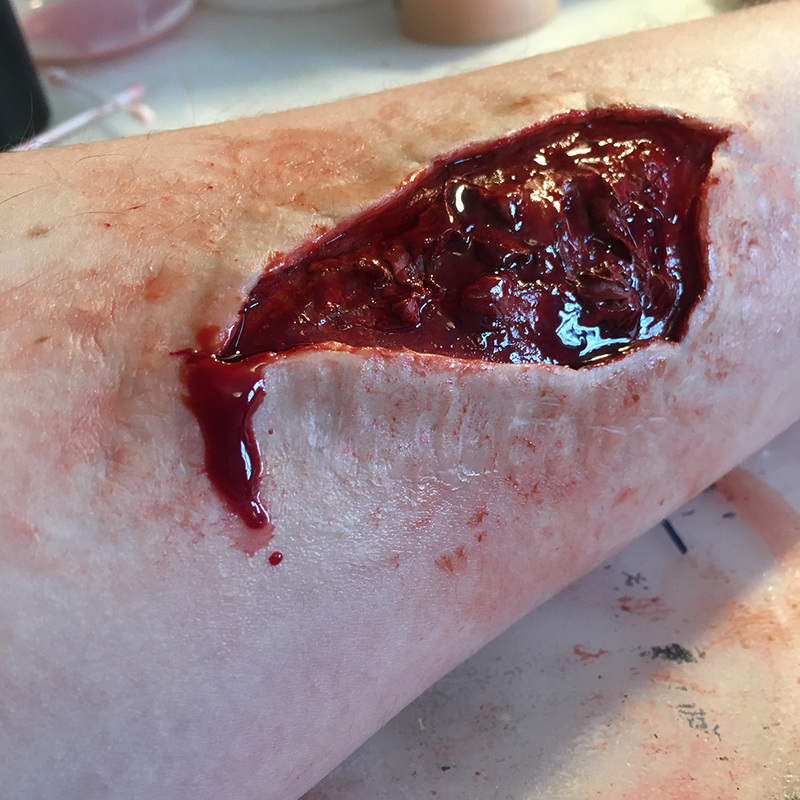 This can be any shape you want, but for something realistic use some images for reference, if you can stomach looking at real wounds! Don’t pull up all the wax, but rather pick at it with a metal tool to create texture, this is great fun, so play around with it until you get some nice lumps and dips in the wax. (If your wax pulls up in one like mine did, just apply some more in the centre, smooth it out and being to hack at it). Now comes the tricky part – color matching. A tip I picked up was to add some 99% alcohol to foundation, as this will remove most of the shine from the foundation and allow for an even covering rather than dumping loads onto the wax. You can either use a makeup brush and dab around the area, or using a brush, use your thumb to flick the foundation around the area (the splatter effect will look a lot more like natural skin, you can even some other colors like red and brown to mimic the natural pigments in the skin!). My favorite part in every SFX look has got to be painting the inside of the wound. It really transforms the piece and allows you to add depth and texture to the piece. I used my Kryolan bruise wheel for this, and I added 99% alcohol to the red and painted the entirety of the wound. Then, using the dark brown color (again with 99% alcohol added) painted the dips of the wax and on some of the lumps. It’s about bloody time! (Get it, because we’re about to add fake blood). Using a makeup brush, paint the inside of the wound and allow this to pool in the dips. 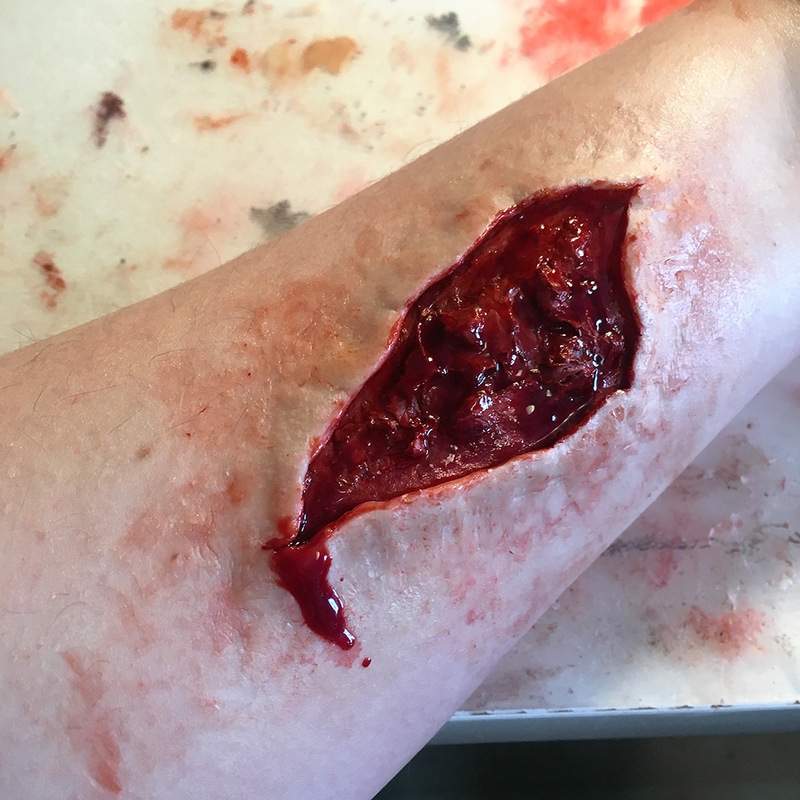 The hardest part about creating a realistic wound is knowing where to place the blood, especially depending on the age of the wound you’re going for. I wanted a fresh wound, still leaking with blood, but that had been mopped up a few times. I used a tissue and dipped into the fake blood and dabbed around the surrounding area. Using another tissue, I cleaned some of this up and then placed a single drip of blood for that leaking effect. I love playing with new techniques when it comes to SFX. Platforms like YouTube and Instagram allow artists to swap tricks and ideas with one another, bettering each other in this truly unique art form. 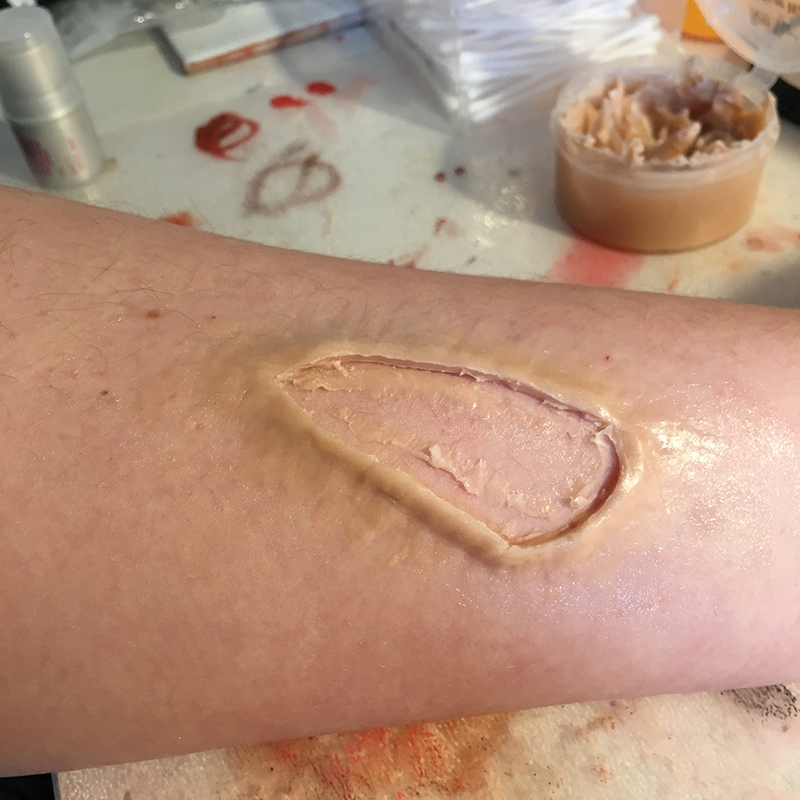 Whilst there’s nothing wrong with theatrical SFX, it’s good to stray outside the box and create something eerily real to really hound in your technique. 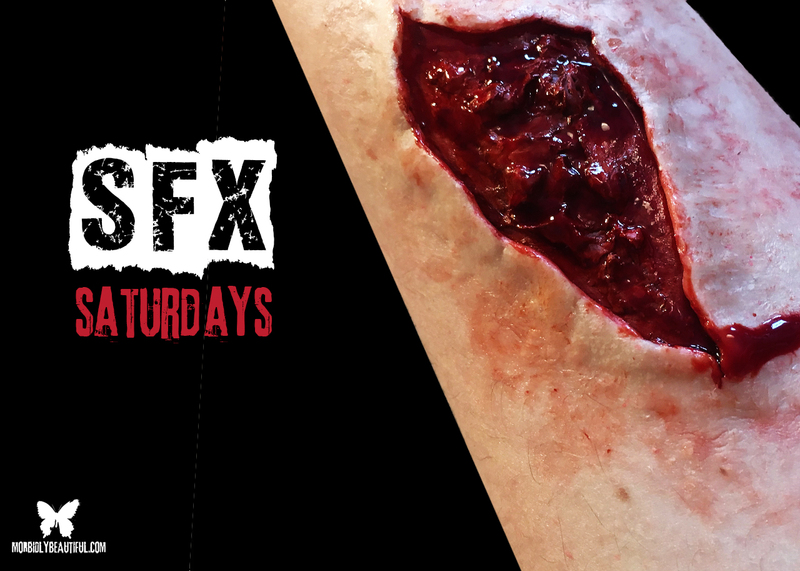 If you re-create this look, be sure to use #SFXSaturdays to let me see your gory handiwork!